Fetchnotes, the Twitter-like lightweight note-taking app that lets you organize your to-do’s with hashtags and collaborate with @ replies, is now offering users a 25 GB of free storage for backing up notes thanks to a new partnership with Box. You would really have to take a lot of notes to use all that storage – something that Box normally charges $10/month for – so it’s a good promotion to encourage signups. The news comes at a time when the startup is also announcing a move Boston, in order to participate in the TechStars Boston Fall 2012 program. And they’ve also closed on a small round of funding from Start Garden LLC, Tim Howes (Rockmelt co-founder), Norm Rapino (Nextronext co-founder) and Wes Huffstutter, the Program Manager at the University of Michigan’s Office of Tech Transfer. Fetchnotes co-founders Alex Schiff and Chase Lee are taking a leave of absence from the University of Michigan to do the TechStars program, they say. They’re also not talking about the size of the round, but Alex says it’s “advisory” sized. (Well, clearly). The new note backup feature allows users to download notes to their desktop or push them up to Box in either txt, csv or json format. For mobile users, it’s a handy feature, but it also competes with Apple’s own iCloud offering which can sync Apple’s native Notes between Apple devices for safe-keeping. And Fetchnotes, while currently a promising app, isn’t just competing with Apple’s native Notes experience – it’s up against a host of other clever to-do list apps, like Any.Do, Clear, and the newly launched Well, for example, all of which offer their own spin on how to improve to-do’s and tasks. That’s why the other new addition to Fetchnotes may be the most interesting of all. 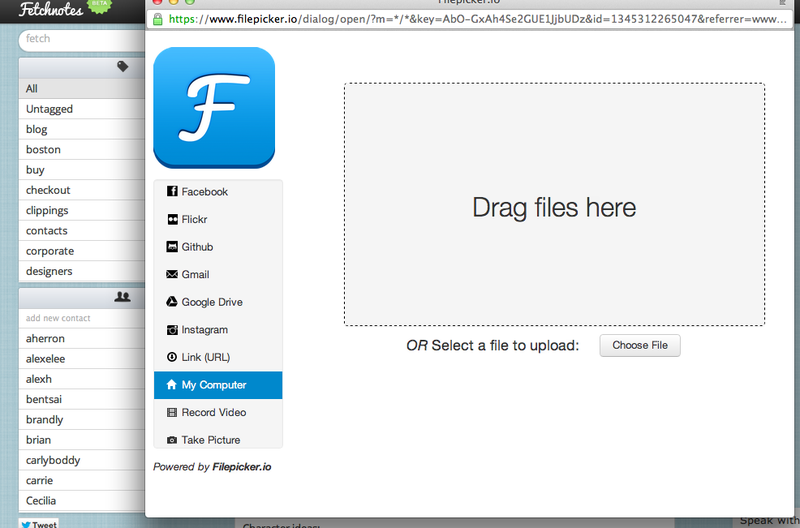 The company recently integrated technology from YC-backed Filepicker.io (on its web app, mobile coming soon) in order to allow users to upload files from other online services (like Box, Dropbox, Evernote, Facebook, etc.) in association with their notes. That puts Fetchnotes more in something like Dispatch territory, and could end up being more of a focus as Fetchnotes refines its product later this year. Stay tuned.